The Good Doctor Prescribes some Cool Vibes and Hot Gumbo. Even today in 2015 these songs sound strange and exotic; so It’s difficult to imagine what people thought at the tail end of the 60’s. Funnily enough after playing this album many times over the course of the last fortnight the only song that hasn’t aged particularly well is the opener, The Patriotic Flag Waver. Let’s just say it was ‘of its time’ as a children’s choir sing the American National Anthem as Mac sings/talks about the problems facing anyone out of step with the current Government. Not necessarily a bad song; but an odd choice for an opener. The bulk of the album has been released and re-released more times than a catfish in the County lake; but put into context with other singles from the same era; they still sound as fresh as the day they left the pressing plant. Maybe the World doesn’t need another album with I Walk on Gilded Splinters, Iko Iko and Such a Night; but who among us will ever tire of hearing them? If you have; you are on the wrong website my friend! Of the songs I wasn’t previously aware of, Big Chief is an absolute joy, with the Doctor whistling along to an odd sounding keyboard instrument before sliding in with his trademark drawl. I Been Hoodood features some triple deep Hammond keyboard and the Doctor’s voice much deeper than I recognise and while the song is typical of his trademark ‘style’ it’s a belter none the less. If for no other reason the album is worth buying for the Huey Smith medley that turns up halfway through. The first time I heard it I was instantly transported to a smoky club in the naughty side of town; full of men not making eye contact and scantily clad ladies that your Mother warned you about. It’s that kind of song. The song most reviewers will pick up on is A Man of Many Words, a UK only single release which pairs the Doctor with guitar legends Eric Clapton and Buddy Guy. Looking at it today; it’s ‘interesting’ but a bit of a waste of the talents on offer. Probably the song that will stick with me the longest is Me-You = Loneliness a US only promo from 1974 for the Desitively Bonaroo LP; which has Mac doing his best Tom Waits impersonation with a handful of peaches and cream voiced backing singers. 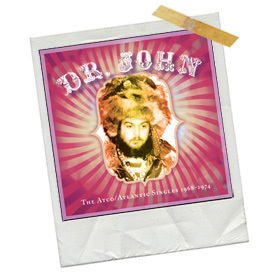 The album closes with a gorgeous rendition of Mo’ Scocious which has more inuendos than a burlesque show and Dr. John sounds every inch the rascal as he serenades a ‘bodacious and hellacious’ young lady of his acquaintance.